We are making payments more secure than ever before. The new authentication system will require every QuickBooks Desktop Payments user to have their own user credentials to be used in QuickBooks for processing payments. 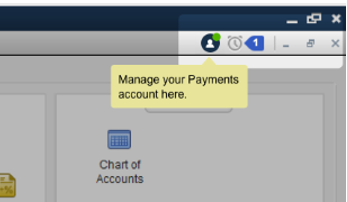 Users who don’t have an Intuit ID can create one and request access from the Payments admin to access Intuit Payments. As an additional benefit of the new authentication system, any update to your account information will be automatically updated across all Intuit products you use with your Intuit ID. Learn more about Intuit ID. The Payments wizard will take you through the steps to get all set up. You may also choose to skip this and we'll remind you later. We'll show you the Intuit ID that we have identified as being used for your Payments service account. This is the one you would have used when you signed up for Payments. If you know the details for the Intuit ID shown, confirm by selecting Yes. If this login is not associated with an Intuit ID, you'll need to verify your email. If it's connected to an Intuit ID, you'll be asked to sign in with your Intuit ID and password and you'll be all done. If this login is not associated with an Intuit ID, you'll need to verify your email and request access to the Payment services account. If it is connected to an Intuit ID, you'll be asked to sign in with your Intuit ID and password and you'll be all done! If we have not found a user ID registered with us for your Payment service account, we will help you set up one account. As a first step you will have to verify the email ID that is registered with us. Note: This is the email ID where you receive Payment transaction details, reports, and chargeback information. You may also choose to skip this and we will remind you later. Email Verified Let's match your email to your Payments account. If you don't have one, we'll set one up. If you are an admin, you will have received an email asking you to set up permission for the new Intuit ID. The requesting user details along with the company file information and Desktop user name is provided in the email for you to review and give permission. Select Set-up user permissions to sign in with your Intuit ID and set the permission you feel is appropriate for the requesting user. The requesting user is notified via email about the access right changes as soon as you have given them permission. Once you have logged in successfully, you can manage and edit most of the information for your Intuit account based on your role and permission. Not only that, you also have the capability to manage most of your Intuit products by selecting the icon in the upper right of your QuickBooks. What is an Intuit Identity or Intuit ID or User ID? Note: If you have set up users in QuickBooks Desktop company file, the username and password to access your company file are not the same as your Intuit ID and Password unless you set it up that way on purpose. The terms Intuit Identity, Identity. Intuit ID, or user ID are used interchangeably. What's the benefit of an Intuit account? An Intuit account gives you the power to manage your business and/or personal finances across all of the Intuit products you use. It allows you to access all your Intuit products, including QuickBooks, TurboTax, and Mint, through a single account. This means you only need one User ID and password. When you update your Intuit account information, it will be updated across all products you use so you won't need to update account information in each separate product. In addition (where available) you may choose to import your information from one product to another, without having to re-enter it. Will I need to create another Intuit account when I want to use a different Intuit product? No, you don’t need to create a new account each time you sign up for an Intuit product. You can use your existing Intuit account to sign up for any other Intuit product. What if I only use one Intuit product? An Intuit account works with one or multiple Intuit products. Your Intuit account information will be accessible to you through any Intuit product you use. Can I choose to have more than one Intuit account? Yes. You may choose to create another Intuit account. Please be aware that if you choose to create more than one account, your account information will not automatically update across all Intuit products you use. How can I protect my Intuit account? Start by choosing a strong password and keeping it safe. Don’t share your User ID or password with others. Learn more about how to protect your Intuit account by visiting our Online Security Center. How do I change my Intuit Account Information or payment information? Enter your User ID and password, then select Sign in. In the "Account Information" box, select Edit to make changes to your company address, company phone, or e-mail. Note: You cannot change your company name, first name, or last name online. If you need to change any of these, you must contact support. In the sign-in Information box, select Edit to change the e-mail associated with your sign-in credentials, your User ID, your password, or your security question. Note: The E-mail address associated with your sign-in Information can be different from the E-mail address associated with your Account Information. If you have one or more credit or debit cards on file, you can also update your payment information. Note: If you don't have a credit or debit card on file, please contact support. How do I recover a forgotten User ID or password? Select Forgot your Password? or Forgot your User ID? Back to Making payments more secure.